Thanks to madam Mayura’ beauty bath we were late by an hour . Bid farewell to Raj as he had to leave for Sillgury while Nima, Mayura , Tshering and Myself proceeded on our way to Gurudongmar with our driver Budul Lachenpa. The road upto Thangu is quite winding as it skirts the valley giving us good views of the waterfall ridden land with pretty rhododendrons and melodious birds. As one rides to the lake one can literally see the change in terrain from the temperate oaks and conifers, to the alpine shrubs, to the barren Tibetan desert. Our drive brought back fond memories of my trip to Ladakh, the barren mountains with the most amazing shades of red, brown and green standing beside snow clad mountains ornate with stunning hanging glaciers. The first thing I felt as I stepped out of the jeep was a tinge of dizziness due to the lack of oxygen reminding me that I was now standing at 17,100 feet. The lake is a pearl in the desert and has a spell bounding beauty. It is the largest lake in Sikkim and is considered a very holy one by the Buddhists and Sikkimese alike. 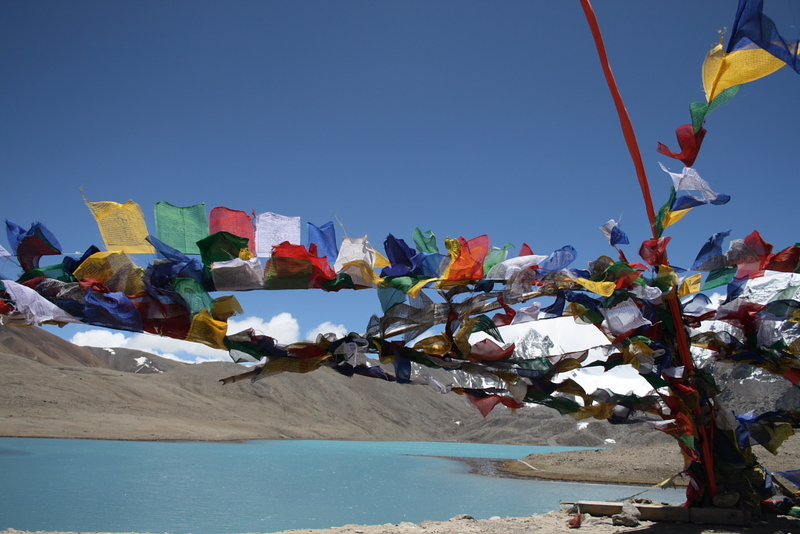 Legend has it that Guru Padmasambhava crossed this lake when he went to Tibet in the 8th century. On the shore of the lake you see all around stones which have been piled one on top of another (mostly four to five stones), like a pagoda called Lapse, this is to ward of the evil spirits and bring peace and harmony in the valley. Recently a footpath has been built around the entire lake, which supposedly takes around an estimated three hours to walk. On our way back we took a brief halt at Chopta valley where there is a yak breeding centre, from where we proceeded to Thangu. Over here I had my first glass of Tibetan tea which I was over zealous to taste, as I wondered how tea with butter and salt would taste. My verdict was a mixed one and in anyways I was to get used to drinking tea with salt very soon. Thangu is the summer residence of the Lahenpa herders as during this time of the year they get their yak, sheep and goats to the green meadows of this valley. There was once a time when the entire village would migrate over here being nomadic tribes, but with changing times most people have settled down in Lachen. The flowering meadows were inviting us for a walk amongst their beauty , to which we readily obliged. Our driver Budul was quite an expert on flowers and had a good knowledge about them and identifies quite a few varieties of rhododendrons, primulas and wild flowers for us. 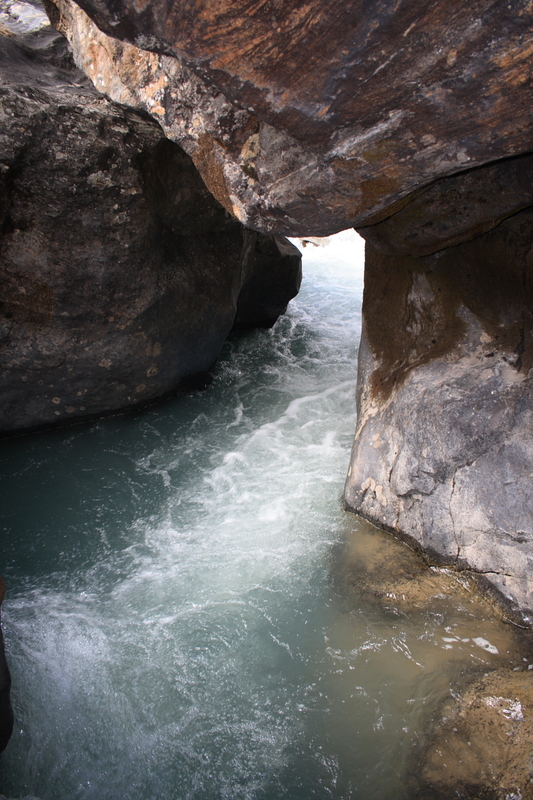 The path meandered through the meadows and led us to the Chopta chu (stream) cutting right across it. The water had carved some amazing rock formations creating some spectacular light effects. Relaxed by the stream for some time before we left to go back and return to Lachen. The entire area near Thangu was covered with flowers giving an appearance of a grand flower basket. I was lost in this dreamy world when all of a sudden I find that Budul had taken a sort of a detour and we were driving on a mud road. He got us to some rustic village covered in clouds, where horses roamed about freely. This was the village of Talem, which somehow seems to have been lost in time. The houses over here are more than a 100 years old, made of mud and timber. There was an amazing tranquility to this place and for a few movements it appeared that I had actually traveled back in time. But a single honk from Budul awoke me from my dreamy state as we returned back to Lachen from a most exciting and enthralling day. we r planning for trip to lachen-thangu-gurudongmer in 2nd week of april.can u suggest in accomodation information in THANGU.